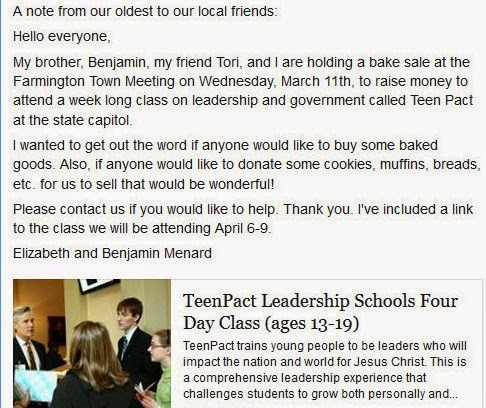 FYI-Money raised from the baked goods at town meeting are going to a local Teen Pact fundraiser. I've listed some of their national associates and donors below. TeenPact Leadership Schools (a.k.a., TeenPact) is a Christian non-profit educational organization, catering mostly to students between the ages of thirteen and nineteen years old, especially homeschoolers. The organization teaches annual classes in the capitols of 41 American states. Their vision statement/slogan is "Changing Lives to Change the World," and their mission statement is, "to train youth to understand the political process, value their liberty, defend their Christian faith and engage the culture at a time in their lives when, typically, they do not care about such things." TeenPact's curriculum and programs generally align with the beliefs of the American Christian right.